Can a single page of a book change your investment life? We believe it can. Periodically, we highlight some of the Great Pages that have had a great impact on our investment philosophy. 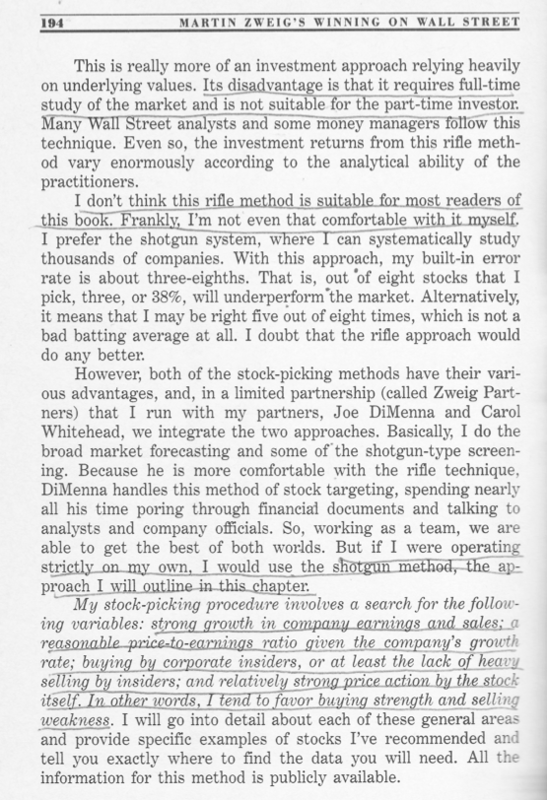 Today, we look at p. 194 from Martin Zweig’s “Winning on Wall Street”, in which Zweig first discusses stock-picking using a “rifle” approach (deeply analyzing a small number of companies), and then talks about the “shotgun” approach (screening thousands of stocks against pre-set criteria). Validea’s Martin Zweig-inspired portfolio is up 199.5% since its mid-2003 inception vs. 99.5% for the S&P 500. Check out its holdings here.